Without a doubt, we can say that Indian cricketers and film stars show a lot of interest in Football, as last week we saw Bollywood film star Shah Rukh Khan pictures with Arsenal footballer Mesut Ozil. In the last La Liga game between Barcelona and Atletico Madrid, Rahul Dravid was left mesmerized by Lionel Messi and Barcelona Show. The former Indian Cricket team captain Dravid was present at Camp Nou to witness this match. Barcelona vs Atletico Madrid Live Streaming Online: How to Get Spanish La Liga 2018–19 Match Live Telecast on TV & Free Football Score Updates in Indian Time? Messi and Luis Suarez scored a goal each to help Barcelona register a win against Atletico Madrid by 2-0. Barcelona reaches closer to retain their La Liga crown. Rahul Dravid spoke with the media post-match, he said that it was an honour to witness a match at Camp Nou and watch five-time Ballon d'Or winner Messi at his best. Dravid also stated that he always wanted to be at this venue to watch a football match and witness the electrifying atmosphere. The Wall Dravid also added that his family enjoyed witnessing the electrifying atmosphere here and it was incredible to be able to watch players like Messi and Suarez play. 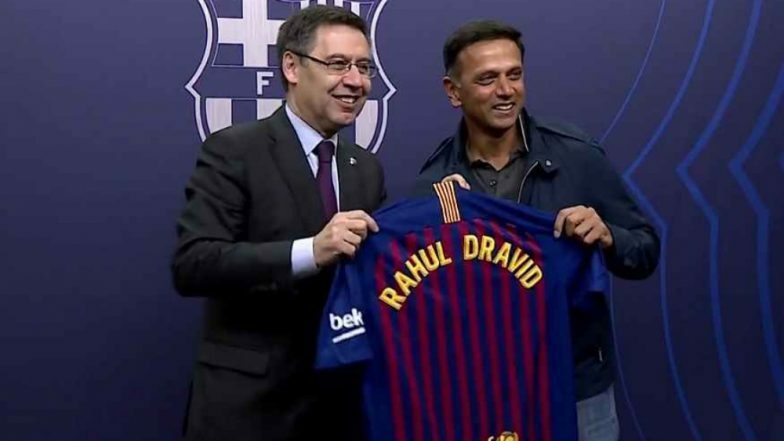 Rahul Dravid received good hospitality by Barcelona club and was even presented with the Barcelona team jersey by club President Josep Maria Bartomeu. Dravid also told the media that the ambience and environment at the iconic Camp Nou are similar to some of the nights in the Indian Premier League (IPL).